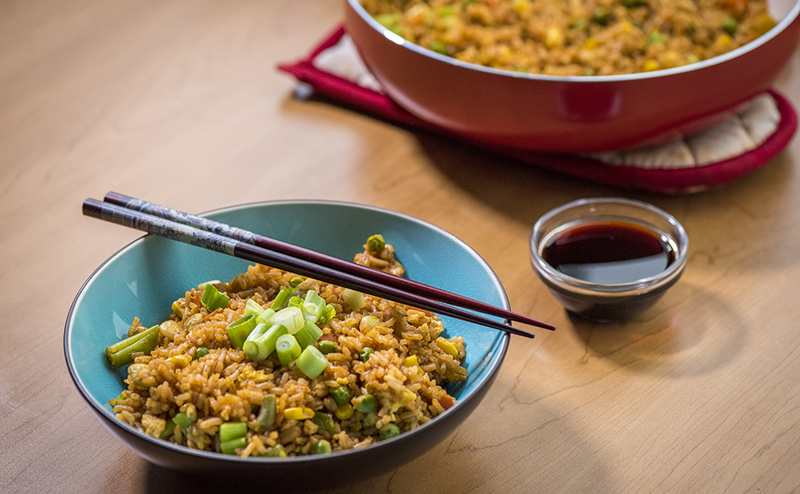 Fried rice just might be our favorite part of Chinese takeout, but we always have more fun trying to recreate our favorite restaurant dishes at home. Well we definitely hit the jackpot with our latest super fast and flavorful recipe! The key ingredient that really makes this meal is chili powder – it doesn’t make the rice spicy, but it does add a ton of deep, aromatic flavor that will make the whole house smell delicious. And this dish is not only tasty, but comes together super fast, making it perfect for weeknight dinners. So next time you’re craving takeout, try this recipe instead, you’ll be glad you did! In a large skillet add oil and veggies, and saute over medium heat until just cooked, about 3-4 minutes. Slide the veggie mix to one side of the pan and add whisked eggs to the other half. Let cook for about 2 minutes then scramble them and combine with veggie mixture. Add rice, soy sauce, garlic, onion powder, chili powder, and ground ginger to skillet. Stir well and cook over medium-high heat until browned, about 8-10 minutes. Remove from heat and stir in green onions.